Shopify is an award-winning e-commerce platform that won our Great User Experience Software Award for 2018 and our 2018 Expert’s Choice Award. It carries a variety of features and tools that enable businesses to build and operate online stores as well as sell products in person. 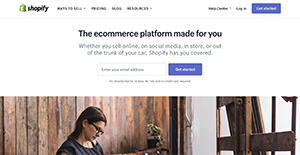 Packed with the right features and used by more than 600,000 business all over the world, Shopify also provides tools specifically designed for offline retail. It’s branded by experts and business owners alike as one of the best e-commerce solutions in the market today (especially the top-notch Shopify Advanced version). It’s currently the no. 1 service in our shopping cart software category. You can also read our Shopify Plus review where we discuss the details of the premium version of this service. Easy and fast set up of a very beautiful and responsive store. Choose from a long list of professionally designed themes to give your online store that corporate look. Your store is hosted by Shopify. That means you don’t have to worry about the technical side of running and maintaining an online store as your servers are scure and updated with the latest software. You get 24/7 customer support. Import catalogues, even large ones, easily and quickly. You get powerful marketing features, easy to use reports, and run your own payment gateway. If you are considering Shopify it could also be a good idea to analyze other subcategories of Best eCommerce Software collected in our database of SaaS software reviews. Every company has its own characteristics, and can need a special eCommerce Software solution that will be adjusted to their business size, type of clients and staff and even individual niche they deal with. It's not wise to count on locating an ideal app that will be suitable for each business no matter what their history is. It may be a good idea to read a few Shopify reviews first and even then you should keep in mind what the solution is intended to do for your company and your workers. Do you require an easy and intuitive service with just essential features? Will you actually use the advanced functionalities needed by pros and big enterprises? Are there any specific features that are especially useful for the industry you operate in? If you ask yourself these questions it will be much easier to find a solid solution that will fit your budget. We realize that when you make a decision to buy Shopping Cart Software it’s important not only to see how experts evaluate it in their reviews, but also to find out if the real people and companies that buy it are actually satisfied with the product. That’s why we’ve created our behavior-based Customer Satisfaction Algorithm™ that gathers customer reviews, comments and Shopify reviews across a wide range of social media sites. The data is then presented in an easy to digest form showing how many people had positive and negative experience with Shopify. With that information at hand you should be equipped to make an informed buying decision that you won’t regret. Everything is great about Shopify - their product, their service, their API, etc. What are Shopify pricing details? What integrations are available for Shopify? Pros: Shopify is all inclusive system. I have used Shopify for my past businesses (consumer goods) and I’m using it right now for sales, promotion and inventory. It is intuitive and easy to set up tool. The customer support team is amazing and they always care about their customers, they constantly release new tools and options. Cons: In my opinion, the different pricing plans are somewhat confusing and the cost of some add-on services can be really high. Pros: I like Shopify because there everything happens with the blink of an eye. We integrated it in a few hours, and got to sell online the very same day. As one can notice, the set up process was pretty streamlined, with no bumps and security concerns to slow it down. I guess we can thank their support team for that, because they didn't abandon us at any moment. I think that the target group are companies which are just hitting off with their businesses, because they don't care too much about uniqueness, and can use some of the beautiful templates Shopify has to offer. Cons: I would prefer it if it was for free, but I guess quality always costs. What I mind is that you don't pay at once, and you don't have a realistic picture of how much the program can cost: you pay for set up separately, you pay for every app and add on, and so on and so forth. Everything is about paying, unless you are able to code your own templates, even though I think big enterprises have no time for that. If you need more information about Shopify or you simply have a question let us know what you need and we’ll forward your request directly to the vendor.